Max Landis broke onto the scene with his indie cult hit movie from 2012, “Chronicle,” a subversive take on superhero tropes. That ultimately got the attention of DC Comics. Or maybe it was the parody short film Landis did that same year, “The Death and Return of Superman.” Landis has a take-no-prisoners approach in his critique on how DC Comics has managed Superman over the years. 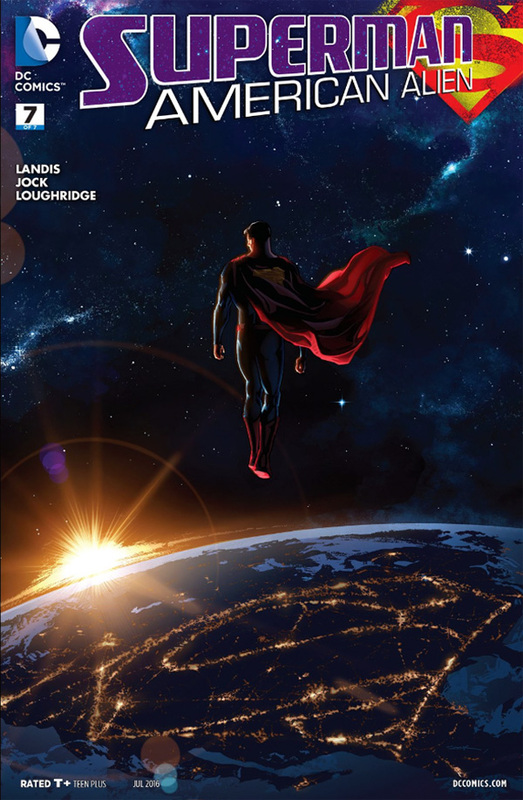 That led DC Comics to invite Landis to try his hand at writing a bit on ADVENTURES OF SUPERMAN in 2014. And now, Landis presents his own limited series, SUPERMAN: AMERICAN ALIEN, which just completed its 7-issue limited run on May 18th. Let’s take a look at the last issue. Granted, Superman is a very special case. As the most venerable comic book icon of all time, he is susceptible to being treated like a rare triple-mint (still in the box) action figure. You can easily end up with stories that are NOT stories but just confirmations on how awesome Superman is. That will placate a die-hard fan but it’s not worthy of a character with unlimited potential, right? You can place the Superman character is any number of situations, modulate the tone, get a little crazy too. In the end, without forcing it, focusing on a good story is how Superman stays fresh and interesting. 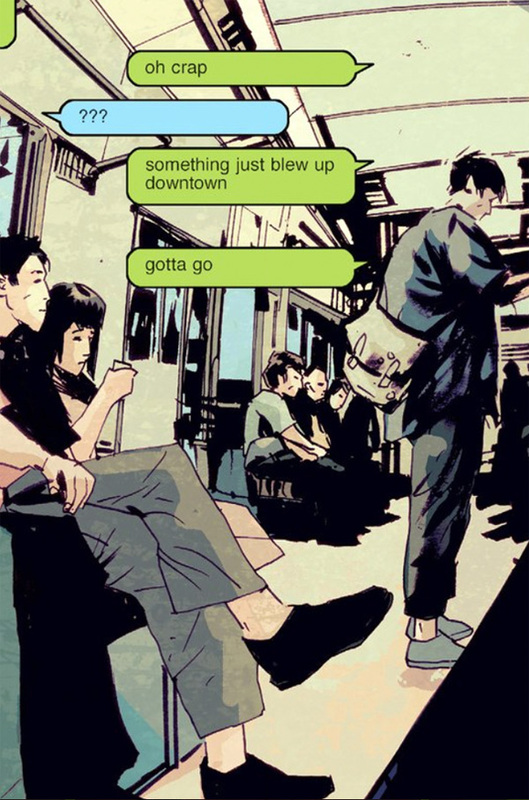 That said, I really enjoyed reading the last issue to this limited series and I tip my hat to Max Landis and to the always dapper and cool artwork by Jock. What I like here is the looseness and irreverence. The series is seven stories in various times in Clark Kent’s life. For this last story, Landis and Jock work as a tag team to bring you a classic final showdown between hero and villain. In this case, Superman battles Lobo from the planet, Czarnia. Lobo from Czarnia? It sounds snarky badass as well as whimsical, something a child might say while playing with a battered action figure. That alone tells you that Landis is playing with a fictional character, not a prized trophy, and trying to shake things up. And that’s really what we want to read more of with our Superman stories. Here’s to reading more Superman stories that challenge the status quo in the future! SUPERMAN: AMERICAN ALIEN is well worth picking up when it is available as a trade paperback or, if you prefer, read the singles! For more details, visit DC Comics right here. Thanks so much, Dawn. I will definitely keep up with your blog and Robert’s blog. Quite fascinating. I look forward to digging deeper and checking out his books. Awesome review. I love the analogy. Yeah I was never one for keeping my toys in the box. I took a break from blogging for a while to focus on some of my musical goals. Sadly not enough hours in the day for all my life’s loves. Damn bills and day jobs getting in the way. Hope this finds you well. By the sounds you’re still going strong as ever! Yes, well put, don’t keep those toys in the box! It’s interesting to see what a talent like Max Landis does with his take on Superman. It provides a fine example of what is possible when you take the kid gloves off in writing Superman stories. Also letting the childlike imagination run amok. All great art comes from such a place of curious indulgence. Great to hear from you. Have you got any projects on the go at the moment? I continue work on George’s Run. The first issue is out and #2 will be ready in the fall. Glad to hear it. Good luck with getting it out there. Best wishes! Thank you, Lee. And all the best to you and whatever projects you are working on. Cheers. Thank you very much. I LOVE that cover! I hear you with this. Superman is an iconic character but appears way too often in unimaginative stories. There’s plenty more that can be done with Superman and all the rest of the DC Comics universe. Great review Henry, I’ve been keeping my eye on this title and plan to eventually check out the collected edition (loving that art by Jock in this issue). Superman is a great character when handled in the right way, which in itself is a difficult task! Thanks, Chris. I think Max Landis ends up doing some interesting things that help move Superman along. There really needs to be more of this loosening of the collar. As much as I support a whimsical/deadly villain as Lobo Czarnia, we need to keep moving the needle past curious novelty. Oh yeah, nice. But we need more! Stories and characters can be stretched so much further. Really interesting stories can be told, not just your typical event cavalcade. And it does happen, it’s just not the norm.